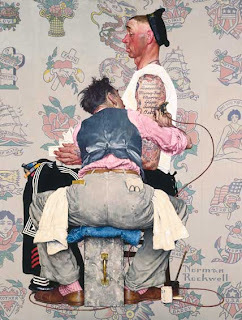 While Norman Rockwell’s paintings are timeless, there are only 10 days left to check out the Norman Rockwell: Behind the Camera exhibit at Brooklyn Museum. On display in the Robert E. Blum Gallery on the first floor, you’ll find the a multitude of carefully-staged photographs that Rockwell used as tools to capture and depict real life in each of his illustrations. The exhibit, which closes on April 10, contains a selection from 20,000 digitized negatives alongside Rockwell’s completed paintings.